DigitalGlobe satellites were able to capture this image of a super bloom in California's Walker Canyon on March 19, 2019. The Landsat 8 satellite, a collaboration between NASA and the U.S. Geological Survey, saw "an explosion" of wildflowers that covered green areas of deserts in Southern California, and DigitalGlobe satellites caught higher-resolution images of the blooms. The wildflowers blossomed following a wet winter in the region, NASA's Earth Observatory reported. USGS captured the images with the Operational Land Imager on the Landsat satellite looking down near the town of New Cuyama, which is about 130 miles (210 kilometers) northwest of Los Angeles. The DigitalGlobe images focused on a location about 50 miles (80 km) southeast of Los Angeles. 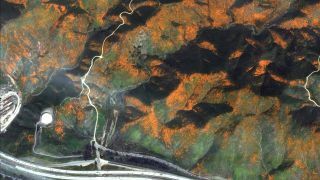 "The colorful satellite imagery shows the hillsides along Walker Canyon, filled with blooming poppies as well as hundreds of cars parked nearby and people hiking along trails in the area," DigitalGlobe representatives said in a statement. An explosion of wildflowers is visible in this close-up view of Southern California from the Landsat 8 satellite's Operational Land imager, taken March 18, 2019. DigitalGlobe is useful for zooming in on small tracts of land, while bigger satellites, such as the Landsat series, are useful for tracking large swaths of land over long periods. The multiwavelength satellites allow researchers to monitor crop health, see how pollution affects the landscape and track the effects of climate change, particularly in northern areas where ice is receding. Landsat is operated by the U.S. Geological Survey and has been gathering data since 1972, when the Earth Resources Technology Satellite (or Landsat 1) launched. Landsat 8 launched in February 2013 and operates in a near-polar orbit, which allows the spacecraft to examine regions all over the world. It also is sun-synchronous, which means it orbits in such a way that the sun is always in the same position in the sky (and lights the terrain in the same way) from the satellite's perspective; this allows for more-consistent comparisons between images. Editor's Note: This article was updated to clarify the location of Walker Canyon in comparison to Los Angeles and to include that the Landsat satellites are a collaboration between NASA and the U.S. Geological Survey.